Ho Ho Ho! This time I am reviewing Frostie beverages that I received from the distributor that now has taken over ownership of the company. 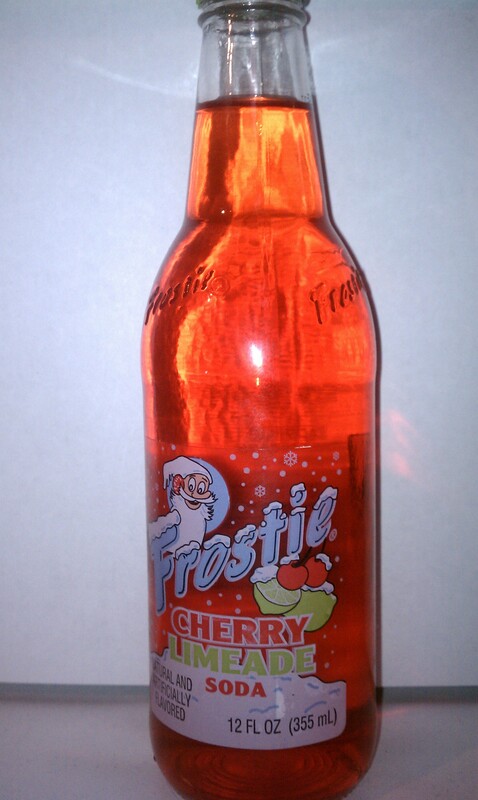 Frostie is an old fashioned soda from as early as 1939 when the owner used an old abandoned jailhouse to launch the drink. It was originally bottled in Cantonsville, Maryland near Baltimore. Intrastate distributors works out of Detroit, Michigan but I am unsure where the soda is bottled today. Frostie Cherry Limeade again was one of the drinks when I first saw I had to try first. I have always loved the combination of cherry and citrus since I was a young kid going out to eat with my family to the Ground Round and would always drink a Shirley Temple with extra cherries. The one thing that struck me right away was the clear bottle embossed with the Frostie named is beautiful, from the label to the bottle cap. Being that is winter the old man winter logo and snow is ever so fitting. I also loved the colors on it. When I opened my first bottle I noticed a slight glitch, the dreaded twist off cap! In my experience drinking as many bottled sodas as I have, twist caps don’t give the pop and good seal a pry cap does and therefore loses carbonation either very quickly or don’t have a lot to start. The only other thing I would have liked to see is real sugar used instead of high fructose corn syrup. The taste was great though the brightly sweet maraschino cherry flavors hits you first and foremost with the lime being detectable all the way though and more pronounced at the finish. A solid drink that reminded me of past, easier times. If you want however, good luck, it has been very hard for me to find. I have to contact the distributors directly to get samples since I couldn’t find them in stores around my area.